On Thursday, 1 Rosh Chodesh Kislev, protests were held in four cities against the continued incarceration of Rachel Noah bas Chedva, who remains imprisoned in an IDF jail after being inducted and refusing to enter the military. Rachel is one of a number of religious women who were drafted but being that they were not frum their entire lives, military authorities do not accept their affidavits that they maintain an Orthodox lifestyle and are therefore not required to serve. Protests were held at 9:30AM and 9:45AM in Yerushalayim, Beit Shemesh, Bnei Brak and in Modi’in Illit. Organizers insist they will continue protests until the “Zionists” release the women who today remain imprisoned. 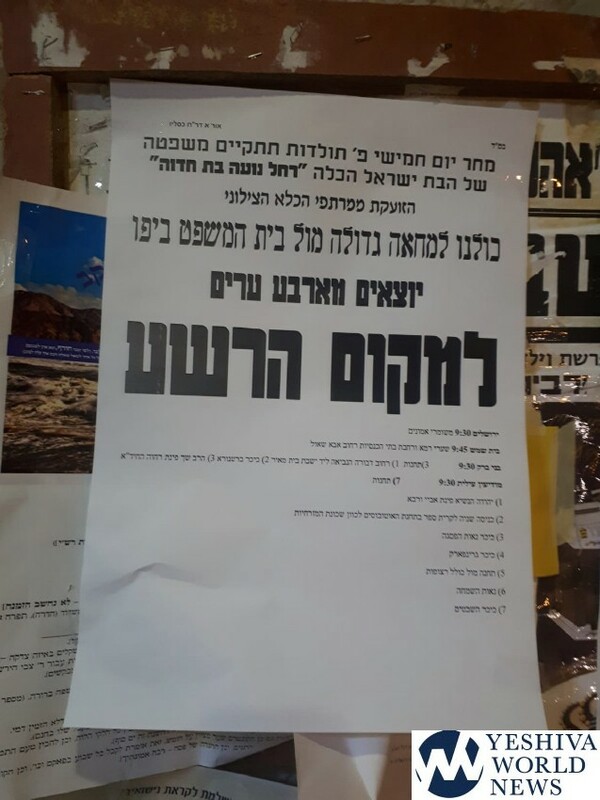 As a frum Haredi Jew living in Jerusalem I would like to point out that these protests against the army are turning many of us away from the Yeshiva community. I have stopped giving tzadaka to anyone who comes into my shule and will now only give my tzedaka to those organizations which I know are not actively involved in fighting the State of Israel. so why don’t they ? The Zionists were always and still are actively involved in fighting Hashem, His Torah and His people. So anyone actively opposed to the Zionists would, therefore, be defending Hashem, His Torah and His people. Yet someone who identifies as “frum” and “haredi” and from the “Yeshiva community” wrote above that he supports the opposite. How sad that is. To the commenters above: What isn’t understood about יהרג ואל יעבור? Every Gadol without exception declared Giyus Banos to fall in that category. The sad part is that there aren’t more of them protesting. This is totally different than the issue of the draft of boys. would anyone explain why zoinists were put in quotes? they themselves admit they are Zionists. is YWN trying to say they are not zionist even though they themselves would admit it? i find that a little over doing it in YWN` attempt to cover up for the Israeli govt.s aveiros ( as they try to do regularly). jeff stuart wouldnt give his money to the chazon ish or rav shach or to rav shloima zalman or rav ahron or rabbeinu yoel and all the other major gdolim of the last dor who waged milchemes hashem against the state of israel, who`s agmas nefesh and actions over these milchamos have made these hafganos look like baby stuff. that being said, i think its very clear that you are the guilty party (and if i were you , i certainly wouldn’t advertise it). if rav shach alienated people from the yeshiva communtiy, then the its fine, becouse the yeshiva comunity doesnt want them either way.